We are happy to announce that the 1st International Conference of Religious and Pilgrimage Tourism "Following in the Footsteps of Saint Pope John Paul II” will take place in Krakow between 8th and 12th November 2017. Professor Jacek Majchrowski, the President of Krakow, invites everyone to attend. The City of Krakow has been designated as the official partner of the Conference, His Eminence Cardinal Stanislaw Dziwisz has confirmed that he will be attending and Mr Jacek Krupa, the Marshal of the Malopolska Region has assumed the honorary patronage over the Conference. We will keep everyone informed about any new partners or honorary patrons, of which there surely will be more. The city of Krakow and the whole Malopolska Region have great potential as a religious tourism and pilgrimage destination. Each year, millions of pilgrims and religious tourists, visit the area, an example of this is the most recent World Youth Day, which was held here in Krakow in 2016. This influx of visitors has great bearing on the city's and region's income as well as boosting employment in the area. "We think there is a niche and a need to organise this new event in Krakow, a unique meeting of specialists from the religious and pilgrimage tourism sector", says Ernest Miroslaw, an organizer of the Conference and the owner of a local incoming tour operator Ernesto Travel, a leading agency specialising in religious tourism. "At this time, there is no similar event held in Central or Eastern Europe. I think it will be a perfect preparative event prior to the UNWTO 2018 conference, dedicated to religious tourism, which will also be held in Krakow. We have participated in many similar conventions and conferences but this time hope to welcome several hundred delegates in this field to Krakow and the Malopolska Region which will include specialists, tour operators, travel agents, priests and others that operate in the religious and pilgrimage tourism sector", says Dominika Krzych from Ernesto Travel, a sponsor of the Conference. The Conference will be opened on 9th November, by both the administrative and the clerical dignitaries of Krakow. The opening Holy Mass will be celebrated at the John Paul II Centre and will be followed by speeches, lectures and a workshop with representatives of local sanctuaries and tourist attractions. 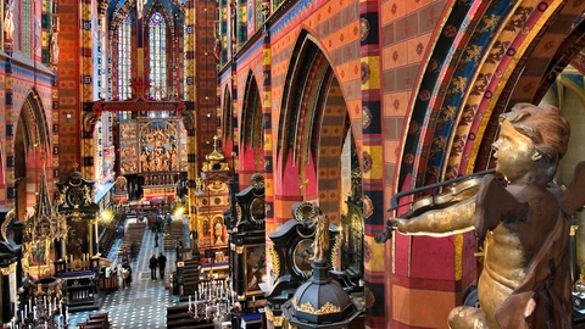 The 10th and 11th November will be an opportunity for the guests from around the world to visit locations in Krakow and the Malopolska Region including Krakow Old Town, the John Paul II Centre, the Divine Mercy Sanctuary, the Salt Mine in Wieliczka, the former German Nazi Concentration Camp Auschwitz-Birkenau, the church and museum in Wadowice (Karol Wojtyla's birthplace), the Basilica in Kalwaria Zebrzydowska and, of course, the Black Madonna Sanctuary in Czestochowa. The Conference aims not just to create the opportunity for tour operators to meet local suppliers but also to promote the city of Krakow and the Malopolska Region as an important religious and pilgrimage tourist destination, not only in Europe but worldwide, and to ultimately strengthen the importance of religious tourism within the tourist marketplace. The organisers hope to welcome all foreign travel agents and tour operators, bloggers and journalists, bishops and priests as well as other religious and pilgrimage tourism organisers such as diocesan coordinators or the leaders of foundations and congregations.